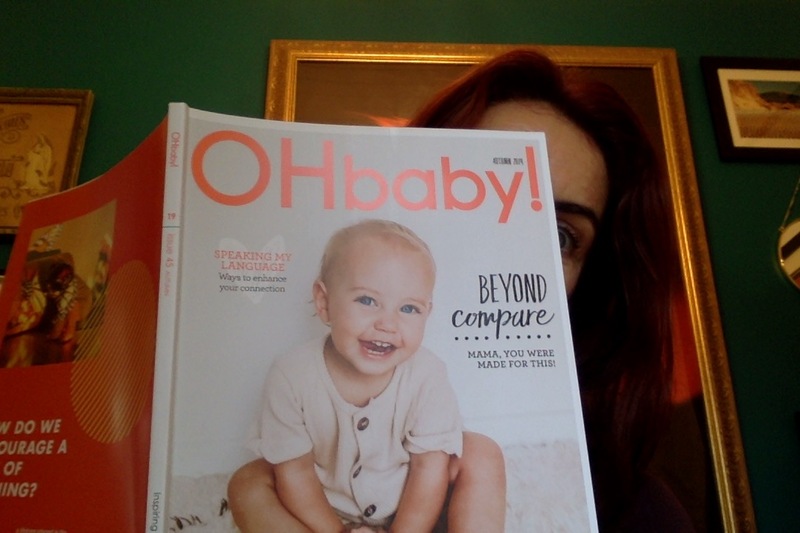 Here I am enjoying the latest issue of OHbaby! magazine. The story referenced on the cover (“Beyond Compare”) is one I wrote for them, about the Comparison Trap. She’s the thief of joy, etc. 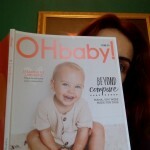 I’m proud of this article and it is my sincere hope that it’ll lighten the load for some mamas. Even if just a smidge. Meanwhile, I am aware of a bunch of really good webinar type online conference sort of situations, and imma share those with you now, lest you have a bit of time, curiosity and flexibility. This is the Happy Child Summit, I hope I didn’t leave posting too late. Quick, check it out for stress-busting and anxiety-conquering information. Free! Happening RIGHT NOW! Also free, also a summit, this one featuring my pal Rick Hansen (*not actually a pal, I just dig his work, and I like to think we’d be pals if he turned up at my place to play board games!) here is the Brain Change Summit … looks juicy … starts (American) April 22, runs for 10 days. Free! This looks awesome, for the educators among us. It’s a webinar called “From Teaching to Thinking” and it’s about fostering a culture of enquiry into ECE (& junior school?) classrooms. It’s on (American) April 17th. Free! And TODAY (which is yesterday in the US) is the most recent of the webinars from the Children’s Screen Time Action Network. These have been GREAT. Although the name of this campaign is kinda lost in translation (“Wait till 8th” is about getting parents to pledge to wait to give their kids a smartphone until they’re in 8th grade, which is year 9 in NZ, aka 3rd Form to us old timers!) the discussion will be relevant, to be sure. Check it out … also FREE! Speaking of “Wait till 8th”, their website has a great article co-written by Richard Freed (whose work I also dig!) and it’s called Parent like a Tech Exec. As we keep learning, as the creators of the addictive technologies we’re all using every day (and giving our kids to use …) are becoming parents themselves, there is a staunch movement to keep their kids away from tech. IRONY! My old friend! You’ll NEVER die! Waiting to give your kids tech is hard, but wise. Soon enough they’ll be all in. did you assume they were both blokes cos I carefully avoided pronouns back there? This geek has had a crazy end to summer & beginning of Autumn. A series of blessed distractions and beautiful messes. International family … travellers enriching my life (and borrowing my office space …) so I’ve been busy with tour guiding, housekeeping, translating. In so doing, I’ve had the great privilege of visiting corners of our lovely island that I had never seen before … like Fiordland, and Lee’s Valley … and many other spots I know and love, like Castle Hill (which is sooooo much busier these days!). So the joy has been forthcoming, and the gratitude for the miraculous accident of being kiwi born. Hard on the heels of all that joy, however, sits anxiety (“I need to hit my desk!”) and her cousin, guilt (“I should be doing some reading/note taking!”). For now, I will clear off the tabs on my computer (OH! the things I long to share!) and I’ll ease back into the river … I’ve got 8 weeks to pull together a major bit of work, and then another 8 to pull together a couple more biggies. I’ll aim to avoid the riverbanks of Chaos and Rigidity, and strive to float down the middle, in the Wellbeing flow, where all is Integrated. I’ll remind myself that I am capable, and that I do actually enjoy this sorta shizz. I’ll also remind my ol’ lady self (just had another birthday, watch me go!) that I AM THE BOSS OF ME … if this work gets the better of me, I have options! I’m not in prison! And if, periodically, it feels like I am … I will remind it’s a prison of my own making! Of course many variations of this wording exist, but the bottom line is that parents are asked to consent for their child to participate in research. Right on! A parent provides consent for a researcher to INVITE a child to participate. That is an important distinction. What else? Here is an amazing article from the deep thinkers at Renegade Inc., this is about education and it is worth a read. More on education, now … Did I share this yet? It’s an episode of the On Being podcast, in which neuroscientist Richard Davidson talks about the need to include kindness and practical love in classroom curricula. Speaking of classrooms, watch out that the youngest kids aren’t disproportionately being labeled as pathologically flawed just cos they’re young (so said research from the University College London), here’s something new to worry about (Wifi and cancer … oh dear) and here is a piece from the New York Times about the digital divide and how it’s not what we expected: these days, affluent parents are keeping kids off screens. Meanwhile, this article, also from NY Times, takes the idea further … Human Contact is Now a Luxury Good). What’s that? We social mammals need social connection? Ya don’t say!! A wee bit more tech stuff, this is about how difficult it can be to think straight with the many interruptions of a phone (BTW how do I make my laptop stop telling me when my phone receives an imessage? I don’t want to know!!) and here the good folk at the School of Life tell us how to live more wisely around our tech. Listen, if those of us who are fully grown are struggling with all this, we owe it to the small people to help them stay offline, and sane. As it is, the internet knows you better than your spouse does (so said Scientific American! ), instagram makes you miserable, and we are all fighting the tide of Persuasive Design!! How to avoid stagnating in that mad place? Well, I look for things that crack me up, I look for ways to feel peaceful and move joyfully. I take action, I donate money (when I can) and I look after my gut! Next time, my friends, we gotta get serious about planning for Screen Free Week, which starts at the end of this month. Till then, take care.